Autumn is a time of year that many of us enjoy for the reds and golds of leaves turning colour, a pleasant crispness in the air and watching the birds migrate south for the winter months. The fall season is also a very important time for our bears as they become eating machines on paws preparing to den for the winter. Bears will consume astounding quantities of food – up to 20,000 calories per day – to build essential fat reserves that will sustain them through the winter. The most voracious eaters are pregnant females as they require reserves not only for themselves during the winter but also to sustain the pregnancy and milk production for her cubs. She may have mated during the summer months but the embryos will not implant in her uterus until the fall. If there are not sufficient nutrients at this time, the embryos will not develop. To reduce the probability of human-bear conflict within the community, it is imperative that bears gain these calories from natural food sources rather than finding easy meals in residential neighbourhoods and recreational areas. 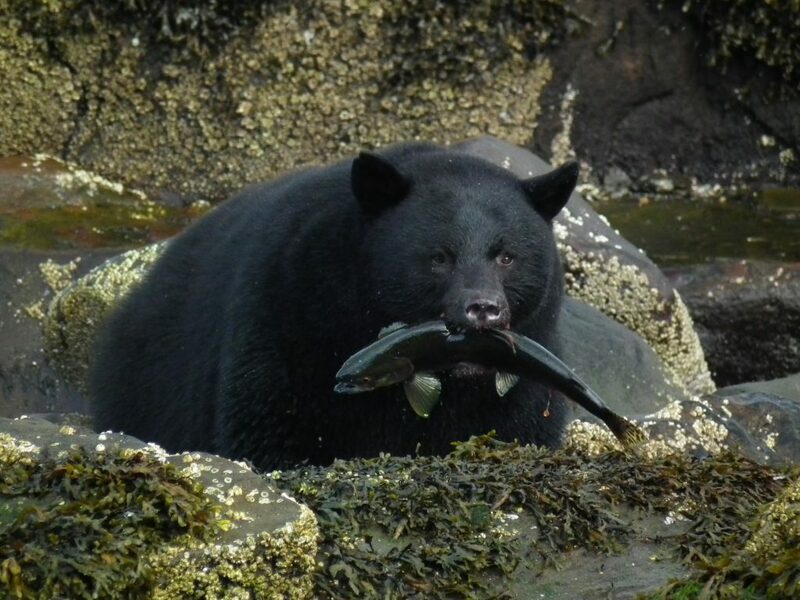 Naturally, bears will fatten up on berries and nuts; the fall salmon run in many areas also provides an important source of food for the bruins. Depending on local availability bears will feed on sizeable amounts of mountain ash berries, grasses (bent grasses, oat grasses, wild rye, fescues, meadow barley), sedges, skunk cabbage, kinnikinnick, salal, Alaskan blueberry, bracket fungus, pacific water-parsley, bunchberry, pacific crab apple, stink currant, evergreen and red huckleberry, salmonberries, devil’s club berries, wild sarsaparilla, raspberries, wild cherries, wild strawberries, wild cranberries and crowberries. Nuts are frequently sought out, especially acorns and beechnuts, as they provide a rich fat source. Nuts are about 50% fat while berries have a very low fat content. Do you live near a forest where any of these natural food sources are found? What does this mean for Bear Smart Community efforts? Since bears are seeking every available food source it is important to maintain a high standard of bear attractant management on your property – as you are the first proactive “wildlife manager’. Ensure that ripe and fallen fruit is harvested daily from your trees, remove bird feeders from your property until winter, keep pet food and dishes indoors, clean your barbeque grill after each use and store it in a bear proof enclosure (for safety purposes, do not store the propane tank indoors) and be sure to store garbage/recycling in a bear proof enclosure until the morning of pick up. While bears do need abundant food sources they deserve to obtain these essential nutrients through natural foraging – not from garbage cans! Do you know that many bears die because garbage bag plastic balloons inside their intestinal tract & they can no longer feed? That’s a pretty painful way to be destroyed. Remember, it takes a community to make change.